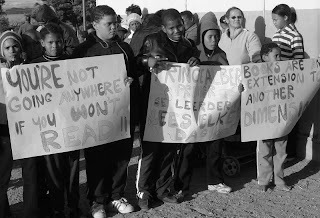 A colourful poster declaring boldly “Prince Albert Primary’s learners read every day” greeted the convoy of mud-splattered 4 X 4s as they pulled into the school’s parking lot on a cold, blustery Saturday afternoon at the beginning of June. The seven off-road vehicles had arrived to hand over several large boxes packed with books, teaching aids, stationery and sports equipment to Prince Albert Primary as part of “Rally to READ’s” campaign in the Western Cape aimed at improving the literacy levels of young children in remote, rural schools. The learners, their headmaster, John Steyn, and teachers who had gathered to meet the rally members formally at first seemed overwhelmed by the occasion. However, in no time the youngsters welcomed the visitors with an enthusiastic interpretation of Roald Dahl’s poem “Television”, which exhorts parents to throw out “That nauseating, foul, unclean, Repulsive television screen” and “watch the slowly growing joy” that fills their children as they rediscover books and reading! Bruce Durham, the leader of the “Rally to READ” team, echoed this sentiment by stressing the value of reading from an early age – the books donated are for Grades 1 – 4. Riette said that the READ Trust would return to Prince Albert Primary in a year to monitor the impact of the Trust’s “Balanced Literacy Programme”, with its focus not only on reading but also on writing and life skills. It would also donate more books to higher grades. Sadly, because Prince Albert was far from READ’s training centres the school’s teachers would not be able to attend training courses. Headmaster John Steyn was delighted at the book donation, which will kick-start the reopening of his school’s library, closed some years ago due to a shortage of classrooms. The Western Cape Education Department provided funding for shelves and other much-needed library equipment. Linda Fodor, one of twenty teachers in the province who was selected to study this year towards an Advanced Certificate in School Librarianship, was as excited as the learners about the prospect that the brand new books hold. “Our kids are desperate to read new stories; they’ve read and reread everything,” she said. The Education Department recently publicly acknowledged the great strides that the school’s Grade 6 learners had made in improving literacy levels. Linda praised the continuing support she had from Reinie Smit and the Prince Albert Library and hoped that one day there would be Friends of the Prince Albert Primary Library, who would volunteer in the library and share their enthusiasm for books. Recognising just how critical it was for a love of reading to be encouraged at home, both she and Steyn would like to see the library eventually open to the whole community. The Rally to READ team that visited Prince Albert Primary was joined later the same day by six other Rally teams that had fanned out across other parts of the Western Cape for their end-of-Rally dinner, where they shared their experiences. All-in-all 153 visitors experienced the thrill of the Swartberg Pass and the warmth and hospitality of Prince Albert’s guest house accommodation. They commented on the special meal prepared for them by Johanna Luttig and her team and on singer Brian Finch, who had their feet tapping late into the night.